If at all i need to say about a bank that sends 300+ promotional emails in a year with useless offers and unlimited terms and conditions, its none other than the ICICI Bank. The only offer that i see worth availing with ICICI in past 1 year is their Super Value Day offer with Amazon, almost every other offer either has lots of catch in it or gives very minor savings. Every day i open their promotional emails and delete them within a second, literally. 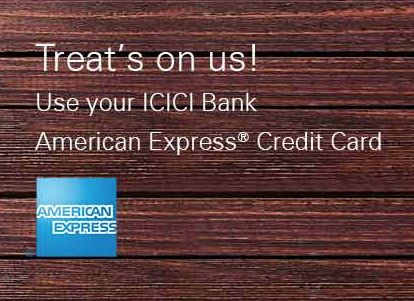 Fortunately, here comes a new spend based offer on ICICI American Express co-branded cards that’s worth reading. Dineout voucher will be sent to the registered email ID: Within 60 working days from the end of every month of the offer period. Looks like the offer was live since July 2017 and surprisingly ICICI sends such good offers only after 2 months of its launch. I haven’t used Dineout yet but i believe its a good service worth using as long as you live in a metro. An important thing to note is, the above offer is possible only because of the presence of American Express. As you may know that they provide 1000 Bonus points on their proprietary cards likes Amex Membership Rewards Card for spends of Rs.1000 X 4 times a month, this offer is also designed similarly. Great move! 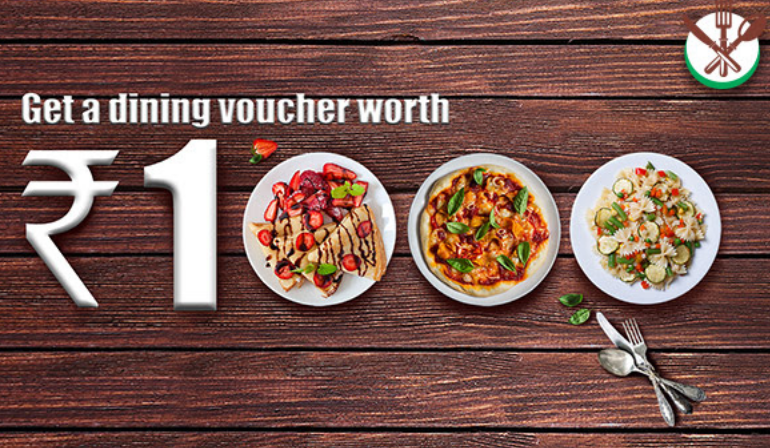 I’ve signed up for the same with my ICICI Jet Saphhiro Amex Credit Card and can’t wait to avail these dining vouchers. Dineout vouchers are 1st of its kind and this is a great move at this point of time as Table Reservation apps are seeing a heavy competition lately. I see a huge scope for dining vouchers in coming years as it not only saves you 25% or so on your bill, but just get that meal for absolutely free. Update Sep 2018: I’ve used the Dineout Vouchers at many restaurants in Chennai and they’re so easy to use – Check out my experience with Dineout here: Dineout Review. I hope Dineout re-runs such offers with ICICI or other bank cards sometime soon. Anyone noticed this Offer before? and have you used Dineout Before? Feel free to share your thoughts below. I love Credit Cards! Minting reward points and cashback for years. Now exploring Airmiles & Hotel loyalty programs. Obsessed with aviation, airport lounges and luxury travel at affordable cost. Iconia Amex is hot.. Has given back much more than the joining fee of 10k with Pantaloons Voucher. Icici bank is best for the Platinum Credit card. It’s Free and provides really nice limit.. Almost as much as my 5 year old hdfc card.. But is Amex Co Branded card accepted by Amazon.in. Applied for it with same Pantaloons voucher and waiting for it. Btw, can you please explain more about “Has given back much more than the joining fee of 10k with Pantaloons Voucher” ? now form march to sept = i have benefitted by more than 28 k almost 3 times of what i paid. and the best part is , it is all cash no voucher redemption . Its Mind blowing to know how everyone is different & creative in getting maximum value out of the card. As you get cash back. Minimum transaction value for a transaction needs to be Rs.500 or above. In case the customer has multiple Axis Bank cards registered on Samsung Pay, the card which has higher number of eligible transactions using Samsung Pay will be considered for Cashback calculation. Cardholder’s eligibility for the offer will be decided by the Bank. The cashback amount will be credited within 60 days from the end of the offer period. This will be game changer when Samsung Pay is opened for all Android Mobiles. By the end of this year, there are high chances of Entry of Android Pay in collaboration with UPI. Won’t matter if Apply pay comes to India or not. 99.9% of the POS machines won’t be supported even if they do launch in India. Only Samsung pay can become mainstream because they don’t need any support at the POS level. One mailer received yesterday, the earlier one was received in July. Dont malign ICICI so much, decent offers were there in recent past. I didn’t receive on July. Is there any other offer worth sharing? Maybe i would have missed out on some. I also see that their ‘good’ offers are not sent via emails, at-least to me, strangely. Thanks for sharing. Sure it helps! “Regular 5% cashback offers on Amex cards” looks like the best among. Will have a track on it. I don’t see these details in the icici page. Which card are you talking about? Can you pls forward me the promo email? Thanks. Vinay, Check ICICI website card offers section. You can filter Amex offers. Need email as they only consider that as a proof. Can you pls send that. It shouldn’t require. If it doe, they may mark it as personalised offer. In that case, forwarding emails received by others won’t help. Hi Rajat, would it be possible for you to forward the 5% cashback offer promo email. Thanks. I havnt received any email but still went ahead and applied for the offer. In the past I have seen that ICICI generally ask for the promotional email before they creditbthe cashback/offer. Can someone pls send me the email of 5% cashback offer and the dineout offer. Many Thanks!!! Now ICICI’s turn to downgrade rewards structure. Minor additions, major deletions to features with effect from October 7, 2017. Could you please explain this point? Any email from ICICI? Check product page for all cards, you will find pdf containing changes applicable with effect from Oct 7 2017. Some improvements but outweighed by negative changes. Have been using dineout for a while now. Have spent over a lakh on dineout till date. I should admit that it has totally been worth it. You get instant discounts at the restaurants, you are able to use your amex cards at places that don’t accept amex and on top of that you get a cashback of around 20% on the amount paid. Thanks for sharing your experience Aayush. JPmiles linking is a wonderful idea. hi Aayush, Can you please elaborate on this ‘getting JPMiles for linking the card’? Thanks in advance. I got the Amex card and have done 4 transactions..lets see what they send me.. Anyone got the voucher for July/Aug spends yet – the T&C says within 60 days but just checking here? Sid – The offer has been extended till 31st Dec 2017, you can update the same here.. This offer is extended upto 31st December 2017. I have received mail form ICICI yesterday on my registered mail. Haven’t received any vouchers in last 2 months yet? Can you advise how do I go about it? I didn’t qualify for any month yet. So others might need to shed some light on this. Contact via customer care email providing offer page link. I too got the voucher today, not sure which month its for. Update: Offer Extended till 31st March 2018. This offer is extended upto 31st MARCH 2018. I have received mail form ICICI today my registered mail. Whom can we contact if we dont get the voucher? What happens to JPMiles post JetAirways shutdown?